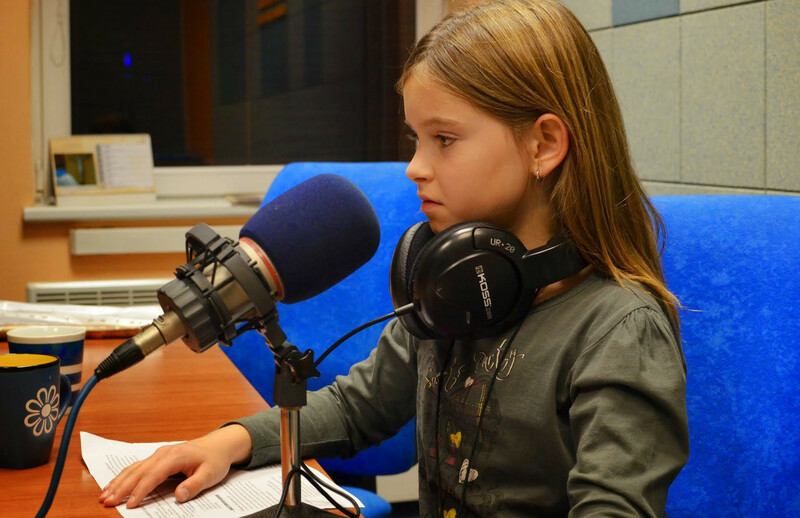 One of Elisabeth’s highlights this school year was getting the chance to co-host a live English language program for children on Slovakia’s Catholic radio Lumen. On June 28th she had her last performance for this school year and I had the chance to get a few clips of the show from the studio. Elisabeth is not exactly born to be a radio personality. I sat in on one of the early shows and watched Elisabeth sit in front of the microphone like a deer in front of headlights. When her co-host asked her a question her first reaction was to nod her head! Gradually she learned that on radio you have to actually speak up. In the beginning, it took a lot of preparation. Every week a couple days before the show she and the writer would sit down and prepare the English dialog for the show. The next night they would go to the studio to record it and then on Friday they would show up at the station at about 6:30 to prepare and then go on air from 7:00 to 7:40. That’s a lot of time for a busy fifth grader! Thankfully, even though she was nervous and it was a lot of work, she stuck to it. Over the course of the year less preparation was necessary. For the last show (recorded above) Elisabeth had almost no preparation ahead of time. The writer put the dialogue together himself and Elisabeth looked it over and made corrections starting at 6:50 before going live at 7:00. I think you can tell she still doesn’t feel completely comfortable in front of the mic, but she does seem like she “knows the ropes.” They even let her intro the show and take a few callers. All in all it was a good learning experience. Next year she’ll probably take a break from radio. But who knows, maybe she’ll have another opportunity in the future.